Of the many photographs that are everywhere in Barbara Crane’s cozy, white-walled studio in Chicago’s West Loop, there is one 8” x 10” image hanging apart from the others that, in a way, started it all, sending Crane and her viewers on a more than six decades-long trip that turned artistic photography upside-down, inside-out, and just about any other direction in-between. In the mind’s eye, the picture’s black, gracefully curving lines set against a stark milky background could be a black-and-white pencil drawing of a young shoot arching toward an unseen sun. Rather, it is an overexposed and overdeveloped gelatin silver print close-up of the backside of Crane’s son, Bruce. Shot in 1964, the photograph served as the impetus for her 90-image master’s thesis at IIT Institute of Design. A self-described “experimenter,” Crane (M.S. PHOT ’66) produced the flowing abstract of her child in response to an ID student who criticized one of her other prints. “I came out of the classroom thinking, ‘I’ll show him! '” says the petite Crane, with a laugh and an ever-present spark in her eyes, which have observed thousands upon thousands of images over a lifetime devoted to a singular passion. Images representing Crane’s career are being featured in three Chicago exhibits. Barbara Crane, Then/Now: The Eternal Thread of the ID Aesthetic, is on display in the Kemper Room Art Gallery at IIT’s Paul V. Galvin Library through Monday, February 1, 2010. A larger exhibit, Barbara Crane: Challenging Vision, is on display at the Chicago Cultural Center through Sunday, January 10, 2010. Being shown as the Stephen Daiter Gallery through Saturday, December 12 is Private Views—Public Spaces: Photographs by Barbara Crane. Crane was assured of her life’s calling when she first saw a print being developed and heard her amateur photographer father exclaim “Abracadabra!” in the dark room of their home in Winnetka, Ill.
A college design teacher introduced Crane to ID founder László Moholy-Nagy’s textbook Vision in Motion, giving Crane her first real taste of ID’s abstractionist ideologies. In 1964, Crane showed Aaron Siskind (1903–1991), ID professor and photography department director, a portfolio of professional portraits she had taken over an eight-year period; he recommended that she enroll at the school and study under him. While at ID, Crane began teaching photography at her alma mater, New Trier High School, chairing and developing the school’s photography program through 1967. 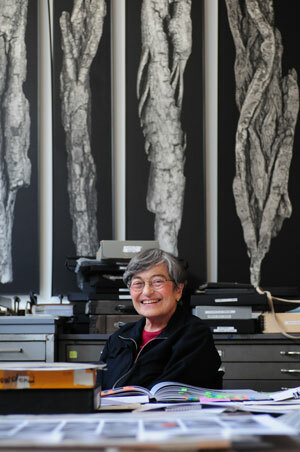 Months after graduating from ID, she joined the faculty of the School of the Art Institute of Chicago, where she remained until her retirement from teaching in 1995. Crane brought a common element to her role both as artist and educator. Crane applies this energy to not only her observations on the human form but to images of urban environments and the natural world in single images, grids, groupings, and scrolls. Her innovative photographs have been featured in numerous publications and shows, and are in permanent museum collections across the United States and around the world. While Crane has used cameras ranging from a twin-lens Kodak Reflex—her first serious camera given to her as a gift for her 19th birthday from her parents—to a Deardorff 8” x 10” view camera, she has now graduated to the digital age, endeavoring to produce photographs that not only excite her viewers but also that one elusive photograph that truly satisfies her.